For the past fIVE years, members of the Swan River Chapter have attended the Junior School Campus of St Hilda’s, in Mosman Park, to offer the year 4 classes an insight into the journey and arrival of the First Fleet into Sydney Cove in 1788. This year there were a few new faces among the staff and volunteers and some returning staff who have retired but could not stay away!! A format similar to the original program was adopted with some changes to the content and many happy enthusiastic parents, teachers and SRC members participating. Activities were in a similar vein to the past days with a few variations and a hearty lunch time soup as a result of the mornings work by the students. The students were in costume and had studied a member of the First Fleet so they could adpot the First Fleeter for the day. 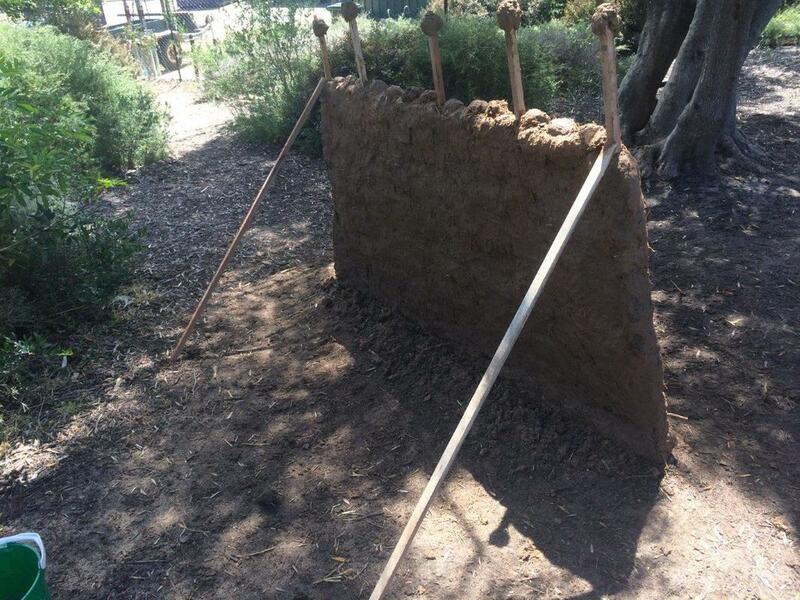 We started a wattle and daub wall last year which was a lot of fun but had to be demolished in case it was a danger to the children using the Bush Area. This year Roger, with fantastic assistance from the retired teachers husband and a father of a student built the MASSIVE construction. A tonne of clay, three bags of straw, water and willing hands converted the ingredients into a fablous structure by the end of the day, the photo above is the final product with the identy of the students hidden for privacy reasons. Thanks to all the Swan River Chapter volunteers, Alex, Roger, Lorraine, Bill, and Julie, who so willing gave up their time and energy to participate in this educational journey and the teachers and mums and dads who helped out. To the Mud Master Roger and staff ....what an epic construction!! ​Swan River Chapter was invited to give a presentation to 70 year 4 Primary children at Highgate Primary School and Julie and Alex Aitken prepared a presentation that would cover the reasons for Transportation, the Trials of John Hudson, Elizabeth Hayward and Jane Langley, as well as the Journey and establishment of the Colony and Norfolk Island. The presentation was to be delivered in two one hour periods with the school recess break in the middle. The interest of the children and staff was very encouraging to the point where it was difficult to reign in the enthusiasm and keep within the time frame. ​Most questions were both innovative and thought-provoking and there were plenty of them. How many generations are you from the First Fleet? How did they sleep if they had no beds? Can we eat some of the Damper and Oatmeal biscuits you have brought with you? The Damper was a hit with some but not everyone's cup of tea!!!!! ​A great morning and the research has revealed many educational resources available to Teaching Staff and FFF enthusiasts.